You may remember Melanie Taylor Burgess’ surprisingly bright and colorful costumes for Richard Strauss’s dark tragedy Elektra last season. 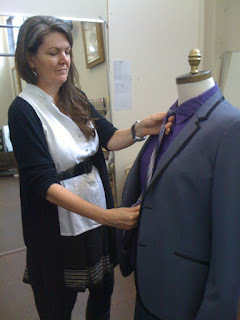 This spring she’s back with the company designing costumes for the Young Artists’ production of a very different Strauss opera, Ariadne auf Naxos. Here Burgess shares a bit about her design process. This is your second Strauss opera with us (and both have some elements of ancient Greek myth). What about his operas do you enjoy? Indeed, it is the Greek myth that has been wonderful to explore. I like classical elements, generally speaking, and that they appear in both operas I have had the opportunity to design at Seattle Opera is a bonus. Although both Elektra and Ariadne have elements of Greek myth, each has a very different feel. When designing a comedy versus a tragedy, how does that impact your costumes? Does it change the color choices, for example? I chose a less than traditional color palette for Elektra but it was very contained and tight—the cool world of Elektra and her tragedy versus the hot, insidious world of Klytämnestra. With Ariadne, the color palette and strong use of pattern can be blown wide open. The difference, really, is how the colors are used together on stage, creating the stage picture for each scene. In comedy, I tend to use a broader stroke. 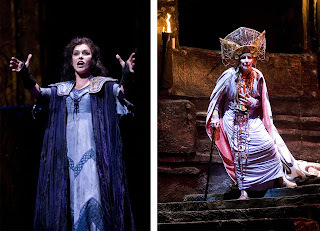 Elektra was very colorful in terms of costumes, and so is Ariadne. What role can color play in enhancing a production? Manipulating the color palette is one of my finest tools. My job as a designer is to provide visual imagery through shape and color, in support of telling the story. All of that is, of course, seen through clothing. Personally, the manipulation of color is the aspect I enjoy playing with the most. It holds much emotional weight as we all have visceral responses to various colors. Does the choice of using strong colors come from you or from the directors? I tend to lean towards color as an evocative element in most of my designs—in other words, I am not afraid to use it boldly. I will generally bring that to the table with my director and through the collaborative process we meld our ideas about it. The costumes for this show are mostly purchased, rather than made—what’s that process like for you? When a show is going to be shopped primarily, it means that my specific design choices will be made not early and on paper—as in a built show—but through the process of seeing what is actually available. I provide my director and shop with collaged images of the “flavor” of what I think the end result will be and then fine tune the design by what is on the rack. Is it difficult to find exactly what you had envisioned? I keep my vision very open, knowing that the prospects are potentially great as long as I don’t narrow my vision too much, thus leading to disappointment at not finding exactly what I have drawn. How does this process compare with a show where you have to build everything? I like the open aspect of a purchased show. The scope becomes much greater then my individual creative process. 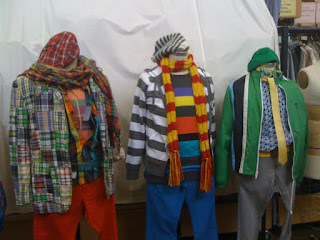 I am inspired by the shape and colors that fashion designers combine into creative clothing. I often say through this process, “I never would have come up with THAT!” And it ends up being the PERFECT choice. In a built show, I have tighter control over the entire process. For me, both methods present their unique challenges and rewards and I am delighted to mix up the process with each project. Check out more costume photos on Facebook. 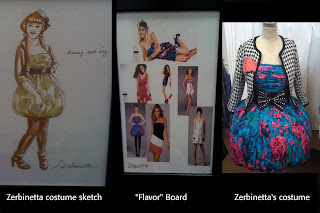 Photos: Melanie Taylor Burgess works on Ariadne costumes; Elektra photos © Rozarii Lynch; Costumes for Ariadne's hipster comedians; Zerbinetta costume sketch and collage by Melanie Taylor Burgess. Great job! Really cool to hear about part of the process. Super costumes.